Valentine's Day is rapidly approaching on February 14th- have you made plans to make the day special for your loved one? We have curated some ideas to celebrate Valentine's Day from gifts to dining. If you are single, why not grab a friend and head to a great restaurant or enjoy a good bottle of champagne? For the chocolate lover, Teuscher is a must! The iconic Swiss Chocolatier is most well known for its Dark Chocolate Champagne Truffles. The company started over 70 years ago in a small town in the Swiss Alps as one master chocolate maker embarked on a journey to find the best ingredients which would lead him to create recipes for, what many critics, regard as the world’s best chocolate. For Valentine’s Day, head to the Boutique on Madison Avenue or Rockefeller Center to pick up the Velvet Valentine Hearts filled with their iconic truffles. Ovando takes a unique approach to floral arrangement, creating stunning displays both classic and modern. Quality and craftsmanship defines the brands beautiful arrangement. The store, dubbed the Botanical Gallery, is a experience not worth being passed up, and can also be rented for private events. The Valentine’s Day collection is filled with everything from heart-shaped arrangements to iconic Ovando arrangements in beautiful pink and red colors. Our team favorite is the iconic floating orchids for which Ovando is known. Ruinart is the oldest champagne house in the world, established in 1729, and producing champagne since. The house barely survived World War I because of severe damage, but we are glad it did! Most of their Champagnes rely heavily on the Chardonnay Grape. With Teuscher Truffles in hand, you cannot go wrong pairing it with Ruinart Blanc de Blancs. If you are looking for a truly special dinner spot where the food is equally as amazing as the views, you must go to Manhatta. Located on the 60th floor of 28 Liberty, the restaurant by Danny Meyers functions on a 3 course pre-fixe menu with an accessible price point. It is time to ring in 2019, and finding a good party in New York can be a challenge - will there is a lot of opportunity for a memorable night, there can also be more opportunities for a disappointment of the party description when you purchased tickets online versus reality. Standing in Times Square for hours with millions of other people is not everyone’s idea of fun, so we’ve rounded up 6 great parties across the city that you will actually want to attend. Raise a glass to 2018 and say hello to 2019 in style! Cipriani Wall Street, located in the former home of the New York Stock Exchange, is hosting a New Year’s Eve soiree in true Cipriani fashion – black-tie attire. The iconic venue will offer Bellini’s upon arrival and a 4 course Italian dinner at the Club 55 restaurant. Dinner will be followed by dancing and Prosecco on tap. For those not looking for sit down dinner, last we checked they were offering general admission after 10pm for $60 per person. Head to the Financial District to Trading Post to participate in a murder mystery. Trading Post, whose interiors remind us of prohibition, will be giving guests fake money to participate and deal their way to solving a murder mystery while sipping cocktails before the clock strikes midnight. By making a “deal” with other guests, you get to ask them a question to help you solve the mystery. You’ll feel like a million bucks if you crack the case! One of our favorites – the swanky Tao Downtown – is hosting a New Year’s Eve party that is sure to be a good time. 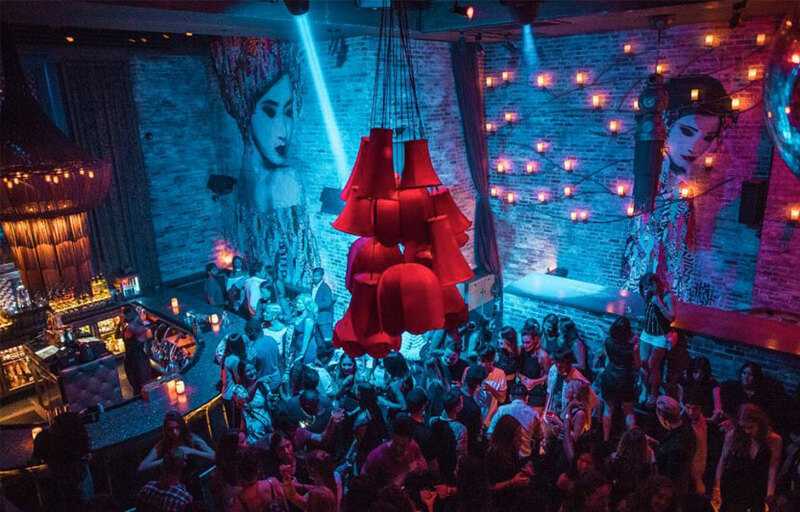 From the large Geisha on the wall to the plush seats and chandeliers, the inside of the Tao Downtown nightclub exudes luxury. Tickets, starting at $200, include hors d’oeuvres, access to a four-hour open bar, and a glass of champagne at midnight. The Public Hotel quickly became one of the “it” spots of New York nightlife when it opened last fall. Ian Schrager has teamed up with Coupette, which will be taking over Diego inside Public from December 29th-31st. Coupette is one of London’s most popular cocktail bars, and bartenders from the London hotspot will be serving 5 of their favorite cocktails for just 3 days. Jean-Georges will be leading the culinary offerings throughout the evening. Palm Court at The Plaza Hotel is a New York icon synonymous with glamour and old-world New York City grandeur. They will be hosting a black-tie Masquerade Ball New Year’s Eve that is sure to not disappoint as Krug Champagne will be flowing. There will also be aerialists, dancers, a live DJ, and special menu. If you are looking to end 2018 with a bang, this may be an option for you as tickets start around $850 per person. 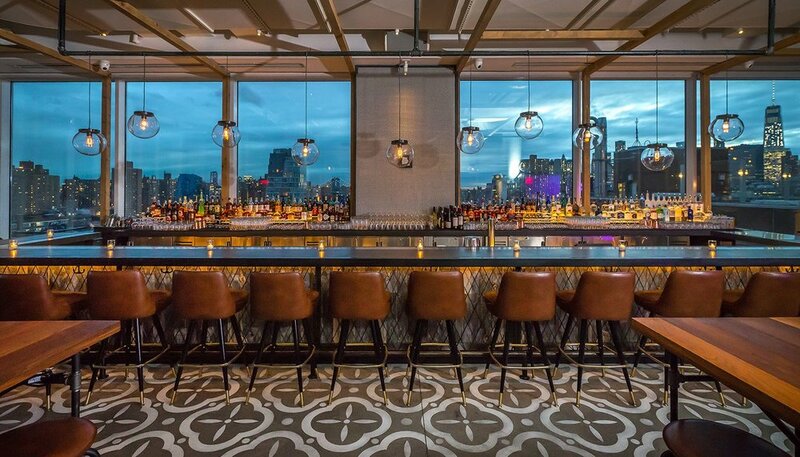 ﻿Located within the Hotel Indigo on the Lower East Side, Mr. Purple is a popular destination for a sophisticated rooftop with great Skyline views. They will be putting on a Burlesque party for New Year’s Eve so find your best fishnets and feather boas to ring in 2019. Looking to get into the Holiday Spirit in New York City? From Brooklyn to Manhattan, Holiday Markets pop-up all over the city. Most of them are put on by the food hall/market experts -UrbanSpace. They are a great place to find unique gifts and enjoy festive food and drink. We’ve included 4 of our favorites and most popular. Each year during the Holiday Season, Bryant Park is transformed into a winter village that is the perfect destination to get into the spirit. The park becomes home to a bunch of shops and food pop-ups as well as an ice skating rink and Christmas tree. Shops include artisanal creations from both local and global vendors. UrbanSpace has created the shops to resemble an open-air style market that you would find throughout Europe. This year, the Lodge by UrbanSpace opened. This pop-up food hall offers breakfast, lunch, and dinner as well as an indoor cocktail bar and outdoor biergarten. Perhaps one of the best known and most popular annual holiday markets is in Union Square. Each year, a portion of Union Square Park is transformed into an open-air market with more than 100 vendors. Whether shopping for unique gifts or looking for a winter treat such as Max Brenner hot chocolate, this market has a variety for everyone. If you are looking to stay out of the cold, head to Grand Central Station. During the Holiday Season, Vanderbilt Hall is transformed into a holiday bazaar that features over 40 booths offering everything from artisanal ornaments to dog gifts. If you are looking for gifts, this is a great place to go as the booths are focused on gifts rather than food vendors. Did we mention, it is indoors? The Columbus Circle Holiday Market is in its 15th year with more than 150 vendors. If you are spending the day in Midtown, Central Park, or the Theater District, this is a great option to check out. New this year is a Citi-sponsored holiday lounge with a photo booth and phone charging stations. The market also has a large selection of food and drinks in addition to crafts and gifts. The holiday season is always a time to give back to those that had a positive impact on our lives over the past year. One question that always comes up, especially in New York City, is how much to tip the building staff and those that are intimately involved in day-to-day life? Tipping is a major part of the Holiday Season in New York, and is a way to show appreciation to your building staff. Thus, it is important to say that it is highly encouraged, but not required. As December rolls around, many begin to get anxiety about who to tip, how much to tip, and if he or she should even tip at all. Our friends at Brick Underground publish a go-to holiday tipping guide, which has been circulating since 2013. We condensed it, and put our take on what is appropriate as you budget for your holiday tipping. Remember, these are simply guidelines. There are many factors that can influence the tipping decision such as the size of the building (a larger staff equates to smaller individual tips), level of service, seniority, and time in building. Additionally, owning versus renting in a building can play a big factor as well. Of course, if you live in a building with a part-time doorman, virtual doorman, or no staff at all, the below levels could be adjusted downward. Renters: Tips do not have to equate to the dollar amount you are paying each month for rent. If you receive a lot of packages, have a stroller that is carried in and out of the building, etc., factor this into your tip. It is recommended that you tip in cash. Doorman, Concierge, Supers, etc. all of bills to pay like you and I- they are not looking for fruit cakes, cookies, or homemade gifts at the holidays! Something to Consider: If you have been tipping throughout the year utilizing a "pay as you go" method, it is customary to tip on the lighter side during the holiday season. Father's Day is just around the corner on Sunday, June 17th so its time to start thinking about planning a special day for him, or, perhaps, a special gift. Father's Day does not have to mean another tie to add to his collection of hundreds. The Victoria Shtainer Team has curated a list of places to take Dad on his special day in the city and The Hamptons from a boat ride to a baseball game, we have rounded up some ideas to make his day special. 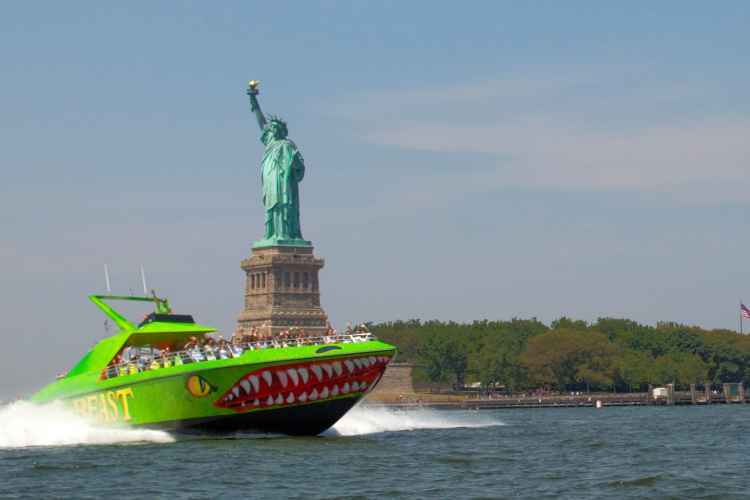 Ride the Beast – Operated by Circle Line Cruises, The Beast is a jet powered thrill-ride on the water. The Speedboat can cruise at up to 45mph – it is powered by twin jet engines after all. The Beast cruises down the Hudson River from Pier 83 to the Statue of Liberty. Boat Departs Pier 83 at West 42nd Street every hour on the hour from 10AM-6PM. Tickets available online. US Open – The 118th US Open is taking place through June 17th at the Shinnecock Golf Club in Southampton. Ticket options range from a Gallery Ticket which provides grounds access to Shinnecock Hills to 1895 Club which gives ticket holders the ability to access the exclusive 1895 Club of Shinnecock Hills. A Day in Coney Island – Head to one of the city’s most popular attractions in the Summer and enjoy a day at the beach, on the boardwalk, or at Luna Amusement Park. Be sure to make a stop at Nathan’s Famous Hot dogs – no trip to Coney Island is complete without it! Rides operate daily during the Summer season. Getting there is easy – simply hop on the D/Q/N or F train to Stillwell Avenue. Yankees Game – The Yankees are playing at home on June 17th against the Tampa Bay Rays. What says Father’s Day like watching one of America’s favorite sports with him? It is a 12:05pm game. Flashback Art Exhibition- The Hamptons is filled with art galleries, and checking out exhibitions is a great way to pass the afternoon. The White Room Gallery has the "Flashback" exhibition on through June 17th. This exhibition features iconic Portraits and Pop art from artists like Joss Parker, Seek One, David Morico, and Strosberg Mandel. Belgian Pretzels and Beer Class – Le Pain Quotidien is hosting a fun class that would make a great gift for Dad. During the Belgian Pretzel and Beer Class, he will learn how to roll, shape, and bake pretzels with a crispy exterior and doughy interior. After they are done baking, participants will enjoy the creations alongside a glass of Belgian Beer. The Tasting House at Sparkling Pointe – Sparkling Pointe Vineyard is celebrating Father’s Day at their Tasting House in conjunction with The North Fork Shack. The Father’s Day event features a tasting of 3 sparkling wines paired with pulled pork sandwiches, pickled watermelon and shallot fries. Wishing a Happy Father's Day to all the Dads out there! We love New York City for many reasons. It is the place we call home and live our passion - real estate. It is also full of so many cultures and experiences. Falling in love with New York City is easy, although everyone loves it for a different reason. Perhaps it is your neighborhood, the restaurants, the array of different types of people you meet, museums, or shopping. Below are some ideas of ways to celebrate the day that is all about love - Valentine's Day. If you are single this year, that doesn't mean you can't have some fun. Grab a friend and take one of our suggestions to fall in love with New York City! Ice Skate in Wollman Rink - Wollman Rink is one of the most iconic skating rinks in the city. Set just inside Central Park off of Central Park South, therink is positioned to take in beautiful skyline views of the 57th Street corridor. Wollman is hosting a Valentine's Day special which includes admission for 2 adults and 2 skate rentals for $35. The Love Of Chocolate Class - The L'Ecole Valrhona in DUMBO will be hosting a "Love of Chocolate Class" which will teach attendees how to make treats such as macarons and bonbons. 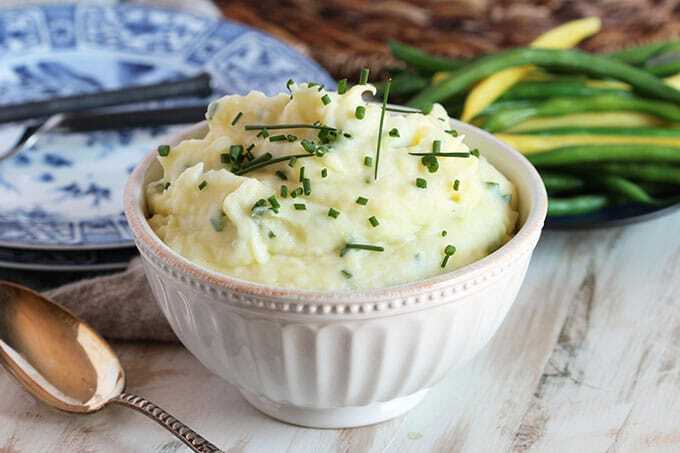 The class will be led by an expert chef who will guide attendees as they enjoy chocolatey cocktails, share hors d'oeuvres, and make a Valentine's dessert. For $119 the class includes champagne, a recipe book, apron, and 20% off the Valrhona website. Romance Under the Stars- This swanky soiree will be held at the American Museum of Natural History’s Rose Center for Earth and Space. It will feature an open bar with cocktails and hors d’oeuvres with a jazz quartet before the show. After mingling, guests will move to the planetarium while Astronomers tell love stories based on the methodology of the cosmos. L’Atelier de Joel Robuchon: Mr. Robuchon was anointed “Chef of the Century” in 1989 and has become the most awarded chef alive. After his Atelier closed in New York City in 2012, he is back in the Meatpacking District! Those who have gone have described the experience at Atelier like none other, finding themselves smiling the entire time throughout the dinner. There are tables that offer views of the kitchen so you can see how the magic happens. Additionally, the interiors are outfitted with a red and black geometric design, perfect for the occasion. A special 4-course Valentine’s Day menu with optional wine pairing is available for $275 per person. Landeau - Landeau has made 25 the new dozen when it comes to giving a "dozen" roses. The delivery will arrive in a Parisian-style hatbox that makes quite the statement. Roses are available in 8 different colors and varieties. The box is also perfect for reusing as storage or a chic addition to a room's decor. Vosges Chocolates - Haut Chocolate house led by founder Katrina Markoff who, while studying at Le Cordon Bleu in Paris, became inspired by Truffle Beignets at Place Des Vosges. This, in addition to her travels throughout Europe, inspired her company here in the States and her Travel the World Through Chocolate collections. She has won numerous awards, and Vosges Chocolates is now best known for its use of exotic ingredients such as spices, flowers, roots, and herbs. Fragrance: Treat your loved one to a new fragrance. Perhaps is your favorite on them or their favorite. We love Creed Aventus for Men with notes of Bergamot and Blackcurrant Leaves and apple. For her, we pick Kilian Straight to Heaven. This sensual fragrance features base notes of Amber Gris and Cedar. It comes in a lockable display case. Fall in love with New York City with our beautiful listing at the Arcadia on the Upper East Side. Enjoy the exquisite interior design from Weitzman Halpern set against the backdrop of floor-to-ceiling windows with skyline views throughout. Ready to Fall in Love with New York? Arrange a confidential appointment with us to find your perfect home. The holiday season is always a time to give back to those that had a positive impact on our lives over the past year. One question that always comes up, especially in New York City, is how much to tip the building staff and those that are intimately involved in day-to-day life? Holiday tipping is an opportunity to give back to those that make running our daily lives a bit easier. Thus, it is important to say that it is highly encouraged, but not required. As December rolls around, many begin to get anxiety about who to tip, how much to tip, and if he or she should even tip at all. Our friends at Brick Underground publish a go-to holiday tipping guide, which has been circulating since 2013. We condensed it, and put our take on what is appropriate as you budget for your holiday tipping. Remember, these are simply guidelines. There are many factors that can influence the tipping decision such as the size of the building (a larger staff equates to smaller individual tips), level of service, seniority, and time in building.